It’s a good day for waiting. Sun floods the city and brightens up every gable on my block. 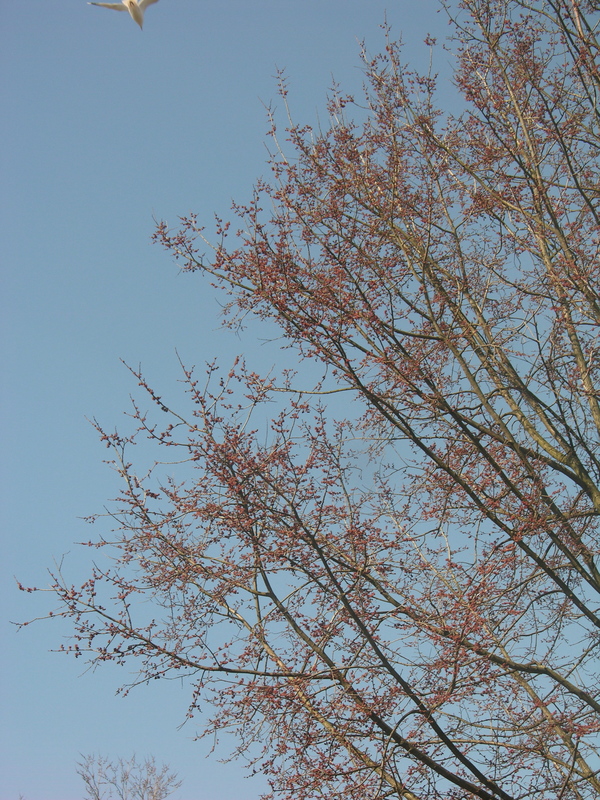 Trees are still bare, but the one in front of my writer’s residence, the elm that almost touches my window with its spiky branches, has formed carmine buds. It won’t be long before they pop and reveal tender green. Blue skies where ever the eye reaches. I know it just appears blue because the air scatters more short-wavelength light than longer wavelengths, but still, it’s a happy sight. A promising sight, for it seems limitless. Days like this make the writer’s waiting game a very bearable one. Don’t worry, I don’t just sit and wait. My mind never sits and waits. It keeps me busy with plot twists and turns, with words, sentences, paragraphs and chapters. It’s the time that I weigh words, unravel motives of my protagonists and antagonists. On days like this I find solutions for translation glitches. These waiting days are important. They give a writer a chance to take a step back from the manuscript and look at it from a distance. My American agent and I are preparing the sample translation of my adventure series Warriors Of the Sun for the International Children’s Book Fair in Bologna, later this month. While she scrutinizes my work, I let the story sift through my fingers, like sand on a beach. I feel the texture of the words and the sentences, feel if the story’s as smooth as a Hawaiian beach or rocky and sharp like the course sand of a Dutch beach. When my agent comes back to me with her suggestions, I have had the chance to review it as well and with joined forces we’ll deliver the most beautiful manuscript possible. My agent and I, we are the Warriors Of the Sun and one day our sky will be limitless. What does a day like this bring you? Holding thumbs for the translation sample. Beautiful analogy between your MS and beaches.. Thank you, Kim. And thank you for holding thumbs! Working hard here to get it all ready for Bologna.